The letterhead has limited styling, however you can simply add images of your logo and motto. 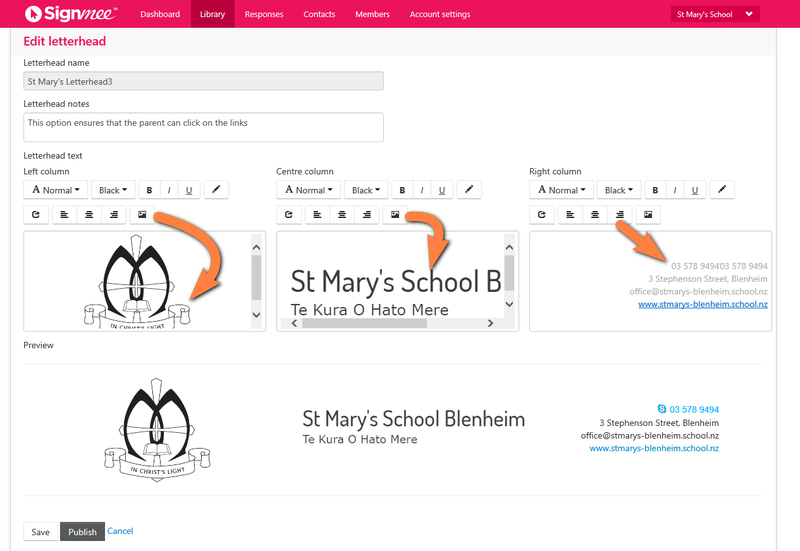 By doing this, you can retain your school branded fonts. For the contact details, simply add text as this will retain links and allow your parents to cut and paste. NOTE: it is recommended that you set up the letterhead using Internet Explorer, as this browser allows you to resize your logo. Then, it is recommended you use Chrome, FireFox, Safari or Internet Explorer 10 whilst using Signmee. Example: Using images for the logo and motto, then text (aligned right) for the contact details. Reminder dates - where can I see the reminder date I set?